Here’s the sad thing about owning a dog: There are too many people and too much street traffic to ever allow your dog to experience the glorious outdoors freely. Whether tiny Shih Tzu, energetic labrador or huge mastiff, most pooches enjoy off-leash freedom only within a small-ish dog park of just a few acres, crowded like a canine city, covered with the smells of hundreds of other dogs who have come and gone. But hiking with your dog on mountain trails can be a great experience for both of you; mountain trails can go for miles. It’s also a great workout for you both, one that easily raises the heart rate because of the altitude and burns off many more calories for a human than just sitting around at a dog park in the flatlands. 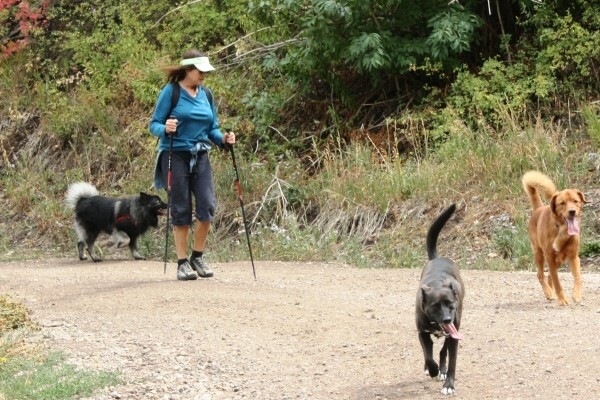 Taking your pooch for a wilderness mountain hike can also make a wonderful memory. However, dogs are not allowed in either Big or Little Cottonwood Canyon. Don’t try to sneak one in; that could result in the dire effect of a $300 fine for bringing a dog into a watershed. Certainly, neither you nor anyone else wants to drink traces of your dog’s urine from the tap, no matter how sterilized it may be. Not to worry. There are hundreds of enticing mountain trails in both the Park City and Ogden areas. You and your best nonhuman friend can even do intervals: Walk for a while, then jog if the terrain isn’t too tricky, walk some more, sprint for 30 seconds where the trail flattens out, walk some more. You’ll both love it. One of the best places to run with your dog is up mountains that have been engineered to have trails and ski lifts with groomed terrain. There will be weeds, but they are fairly sparse and dry this time of year. You can walk up areas where you ski or snowboard in the winter and see what the terrain looks like when it’s not covered in snow. If you want more shade, remember that most ski areas are nestled within forests, and there are usually many trails though the trees to explore. At first, Fido may explode with rambunctious energy, yanking on your leash arm, because the smells of wildlife are so interesting and enticing. But running up a hill at altitude will soon prove tiring. Within a reasonably short time, your pooch will be happy to walk along at a more sedate pace. There are already bright patches of color in places like Huntsville and the higher levels of Park City. Autumn leaves turn a mountain hike into a visual treat. Bring a camera to take a tangible memory to keep and decorate your Facebook page. Meanwhile, you do have to ensure your dog’s well-being, especially if this is one of the first times you’ve taken your pet hiking in the mountains. Carry a backpack with water and a collapsible dog bowl, which can be found at most pet stores or outdoor shops. Use the bowl at home first to accustom the dog to drinking from it. About every half hour of the hike, give Fido a drink. Just as important: If your pooch’s paws are only accustomed to short walks on smooth asphalt or concrete, they may be too tender for a long hike on the hard-packed dirt and stone-strewn trails. Until the dog’s paws develop thicker calluses, limit mountain hikes to just a few miles, especially on a hot day. Park City’s Mountain Trails Foundation has a terrific interactive map you can use to plan your mountain hike. Go to MountainTrails.org/map. You’ll see a series of snakelike blue lines intersected with yellow dots. Hover your mouse over the dots for the name of the trail. Click on a dot for directions to the trail. The congestion of blue lines at the bottom center of the map are the most popular hiking/biking trails in the mountains of Park City. Wandering through the woods or up open meadows where lifts will be running in just a few months is terrific exercise for you and your dog, and a great way to say “adios” to summer.